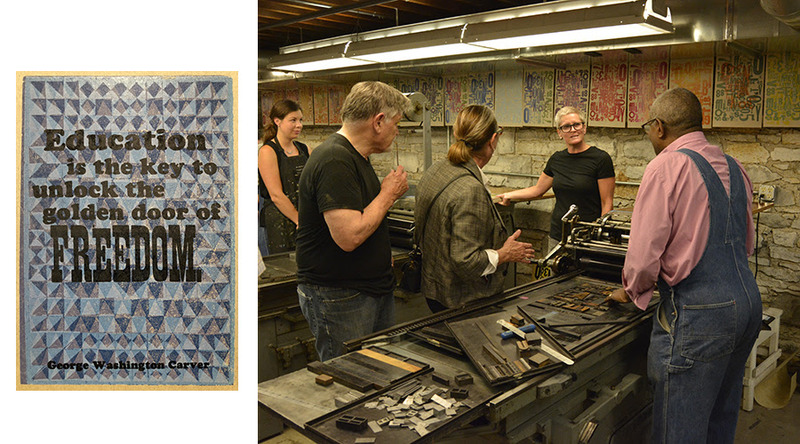 Extra Virgin Press has spent seven summers learning from the letterpress community in the Twin Cities of Minneapolis and St. Paul, Minnesota. Letterpress printing in Minnesota is alive and well, growing a new generation of printers in the Midwest. We will bring that knowledge back to Miami. Your donations to Extra Virgin Press through GiveMiami will offer us another chance to visit this vital printing community, to purchase type and specialized tools, and bring it back to South Florida. The Minnesota Center for Book Arts hosted Amos Kennedy and one of his many powerful community oriented prints in July 2017. He filled the MCBA with 6500 prints. Extra Virgin Press is proud to be supported by our local community, students, writers and artists. With your help, last summer I was able to watch the best printers on the planet in the Twin Cities (Minneapolis/St. Paul). Extra Virgin Press was also able to secure a bit more wood type from the print rich Midwest. 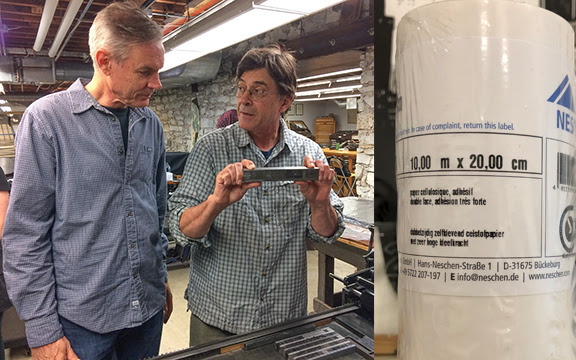 The goal is to return to Mpls again summer 2019 for the MCBA Book Arts Biennial and more time in the studios of master printers. This blog is a gift of collaborative knowledge across many aspects of printing with the letterpress. Pass it along to other print people who support the future of letterpress in South Florida. 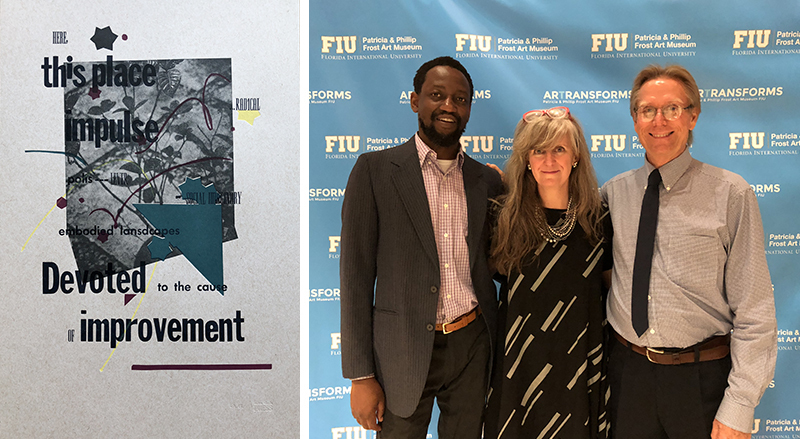 Our GiveMiami goal this year is $4,000, for travel, type, and training with master printers in Summer 2019. Give Miami Day 2018 is almost here! Donations will be accepted from 12 a.m. on November 15, 2017 to 12 a.m. on November 16, 2018. 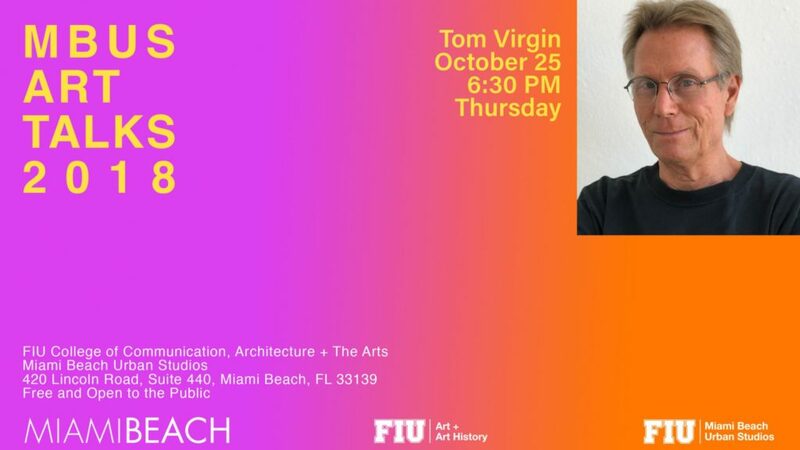 Tom Virgin believes in the power of art and how it can help create a better, more connected community. 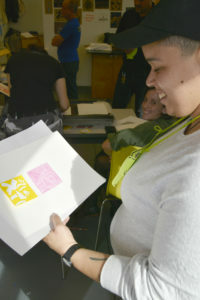 The Miami-based high school teacher and activist is also a printmaker and artist who works in woodcuts. 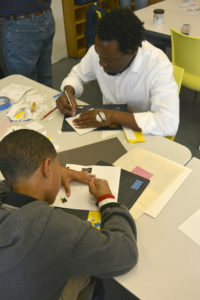 In addition, he’s the founder of Extra Virgin Press in Little Haiti, which makes letterpress book arts and broadsheets. 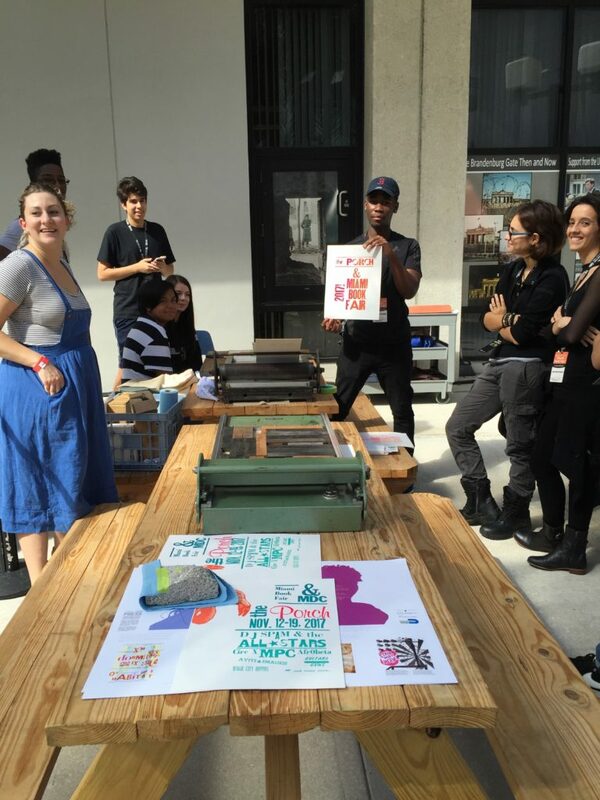 Volunteers and interns printing at the Miami Book Fair in late November 2107. This annual event brings devotees of the printed page together, not just to read… But to print as well. It is our mission to keep this tradition alive. 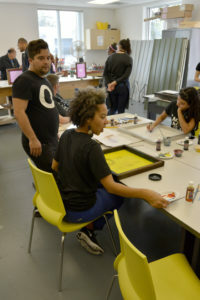 In January 2018, Extra Virgin Press brought its talented interns to Little Haiti Cultural Center to print with MDCPS teachers and teaching artists from PAMM. 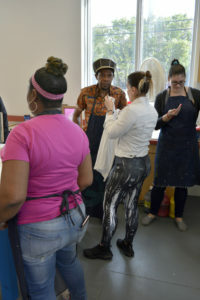 This vital neighborhood hub has workshops in silkscreen printing, a gallery, community artists, and visiting artists such as Extra Virgin Press and Thom Wheeler.